I was born in Sheffield, England, in 1950. My family emigrated to Canada in 1957. We lived first in Toronto then Montreal, and my teenage years were spent in the latter city's west end, the English-speaking part of town. I made a stab at university in 1966, but the Zeitgeist got the better of me and I spent the years from 1967 to 1970 in the hippy subculture traveling back and forth across the United States and Canada, "looking for myself." Though my interest in Indian culture and religion had been developing for years beforehand, it took a serious turn in 1970 when I became a member of the International Society for Krishna Consciousness (ISKCON). My ISKCON career lasted nine years. After the requisite brahmachari and sankirtan training, I became a Sanskrit editor for Iskcon Press publications in 1972, and not long afterwards became the first Sanskrit teacher at the ISKCON Gurukula in Dallas. 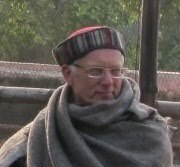 In 1975 I came to India and spent four years as the headmaster of the Gurukula [See 2.9] at Mayapur Chandrodaya Mandir. The name A.C. Bhaktivedanta Swami Prabhupada gave me was Hiranyagarbha Das. 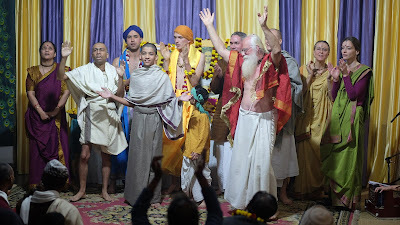 By the time I joined, the insulation of Bhaktivedanta Swami from the rank and file members of ISKCON by the "inner circle" of disciples had already begun. What was not achieved by protective layers of guarding was attained by an aura of awe and reverence that surrounded Srila Prabhupada. Though I never rose above rank and file status during the time that Prabhupada was present and associated primarily "through service," I still had several personal audiences with Srila Prabhupada, which included my reading a verse translation of the Bhagavad Gita I had written. 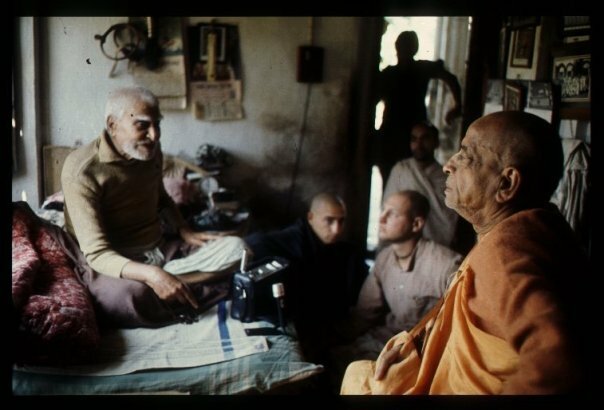 Prabhupada told me personally on that occasion to "become a guru." 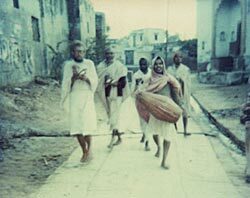 When Srila Prabhupada left the world in 1977 I was in Mayapur. Though I joined in the general mood of grief and loss, my instant and overriding feeling was that my days in ISKCON were numbered, as my need for direct guidance was still strong and I could see no one within the organization who could give it me. Not long afterward, I had the honor of being asked by ISKCON leadership to carry out one of Srila Prabhupada's last requests, namely to visit as many of Nabadwip's Vaishnavas, both Gaudiya Math and from the traditional sector, to ask forgiveness for any offenses that he might have incurred in his preaching activities, and to give them a donation for "Vaishnava seva" on his behalf. 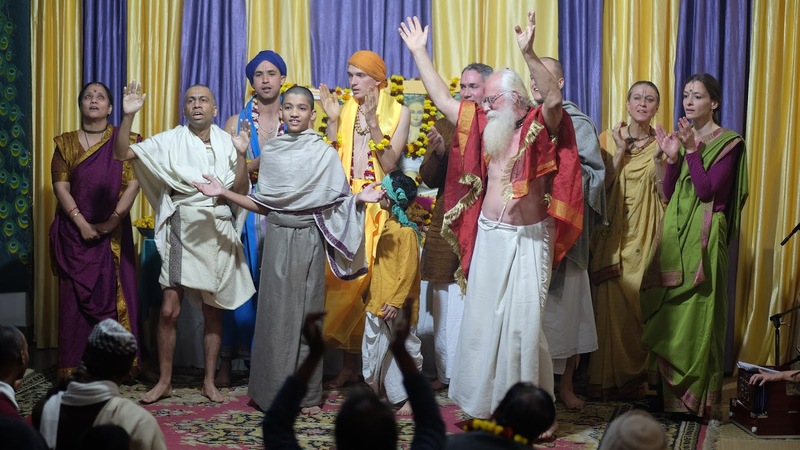 This gave me the great opportunity to meet most of the living acharyas of the Gaudiya Math, Goswamis and members of other traditional Vaishnava lines. I was most impressed by the humility with which one and all accepted this last, most exemplary request made by Srila Prabhupada. One of the first people I visited was Sri Lalita Prasad Thakur. Srila Lalita Prasada Thakur meeting A.C. Bhaktivedanta Swami at Dwadash Mandir (the birthplace of Bhaktivinoda Thakur) in around 1972. Radha Kund in 1983. Photo by Mark Tinghino. On Gaura Purnima in 1979, I took sannyasa in ISKCON, and then in the same year I was initiated and took babaji vesh from my Gurudeva, Sri Lalita Prasad Thakur, son and initiated disciple of Bhaktivinoda Thakur. He also gave me siddha pranali and an entry into the traditional world of Gaudiya Vaishnavism. The immediate effect of this new initiation and a few weeks of staying in Birnagar with Prabhu, was a period of intense bhajan at Puchari by Govardhan and at Radha Kund. I was in Puchari when Lalita Prasad Thakur left this world in 1980, at the age of 101. My connection to him and the disciplic line beginning with Nityananda, Jahnava Thakurani and Ramachandra Goswami of Baghna Para, and through to Bipin Bihari Goswami and Bhaktivinoda Thakur was the single most important event in my spiritual life after joining ISKCON. Sri Sri Lalita Prasad Thakur gave me the name Jagadananda Das and told me to "bring joy to the world." 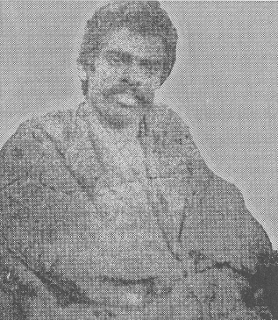 Sri Sri Ananta Das Babaji Maharaj, Mahanta of Radha Kund. For most of the next six years I studied, traveled, lecturing in Hindi and Bengali in West Bengal, Bangladesh, Orissa and Uttar Pradesh. There are too many sants and sadhus with whom I made contact during this time. I should mention a few at least: Sri Ananta Das Babaji, who became and continues to be my greatest inspiration in terms of rasika Vaishnava scholarship in the Gaudiya tradition; Sri Madan Gopal Goswami, grandson of Pran Gopal Goswami of the Nityananda Vamsa, who was my friend, neighbor and great supporter during the years I stayed at Gokulananda Ghat in Nabadwip; and Hridayananda Das Babaji, disciple of the great Ramdas Babaji of Nitai Gaur Radhe Shyam fame. I should also mention Nimai Chand Goswami of Shrivas Angan and his sons, especially Sri Jiva, Svarup Damodar and Ramananda, "Debu Da", the successor of Kanupriya Goswami in Prachin Mayapur, as well as Tin Kori Goswami Prabhu and all his Nabadwip disciples. There were many other friends and influences, many of whom were just interesting characters populating the Vaishnava world, too many to mention. I bow down to all of them. Part of the time I spent studying at the Nabadwip Sanskrit College for a traditional Tirtha degree in Vaishnava philosophy under Kanai Lal Adhikari, Pancha Tirtha, which unfortunately I did not complete. And, of course, Sachinandan Das Bhakti Prabha, my godbrother, whose commitment to kirtan inspired more people than probably even know about it today. The next turning point in my life came during the last year or so I was in Bengal, when I came into contact with "heterodox" (apasampradaya) elements in the Vaishnava culture. I had a lot of things to sort out and found it difficult to continue in the community of which I had become a part, and so I made the decision to return to Canada after almost 11 continuous years in India. The return to Canada in 1985 was one of culture shock combined with a deep sense of incertitude about the value of my experiences in India. I plunged into the study of comparative religion at McGill University with many fine professors. I was especially enriched by the various approaches used by historians, psychologists, anthropologists, sociologists and philosophers to explain religious phenomena. By the time I had completed my B.A. in religious studies, winning the Birks Award for the highest GPA in the department, I felt myself on a much surer footing. On the whole, though, the most lasting influence came from my readings of Freudian and Jungian psychology, which on the one hand made the relation of sexuality to the entire psychic apparatus explicit, and on the other that of religious symbolism to personal individuation or the growth of spiritual maturity. These two understandings are, whether everywhere stated or not, deeply tied to my conviction that sexuality is at the essential core of religious experience and mysticism, especially where Radha and Krishna are concerned. With the help of these thinkers, some aspects of Sahajiya practice make rational sense to me, besides being experientially sound. In 1988, I won a Commonwealth Scholarship to study in England, where I was accepted at the School of Oriental and African Studies (University of London) in the PhD program. It took four years to complete my dissertation (1992), which was on Jiva Goswami’s Gopāla-campū, a treatment in prose and verse of Krishna’s life based on his siddhāntas in Kṛṣṇa-sandarbha. On my return to Canada, I received a post-doctoral fellowship at the University of Toronto and subsequently taught at the University of Manitoba, teaching religion, Sanskrit and Hindi. During this time, I also taught courses in Hatha Yoga and meditation. Fortunately or unfortunately, I was never able to get full time engagement as a lecturer in any university and so was forced to look for other means of making a living. After 1994, I worked as a translator and editor for Mandala Publishing in San Francisco. For the most part, I worked on books by acharyas of the Gaudiya Math, especially Srila Bhakti Promode Puri Maharaj and Srila Bhakti Ballabh Tirtha Maharaj. Mandala also published a scholarly translation I did of Rupa Goswami’s Haṁsadūta and Uddhava-sandeśa (Mystic Poetry, Mandala Publishing, 1999). I have published numerous articles, primarily on Vaishnava history and siddhanta. Many of those articles can be found on this blog. During this time, I also taught a few courses at McGill University. I also translated a number of books from French to English, as well as doing freelance translation work. After returning to India in 2008, I spent several years at the Swami Rama Sadhaka Grama in Rishikesh where I taught Sanskrit and learning the Himalayan tradition of meditation yoga. This was tremendously beneficial and I am eternally grateful to Swami Veda Bharati, an unparalleled scholar and sadhaka in the yoga tradition, for his many kindnesses to me. I have also helped edit the new edition of Swami Veda's first volume of the Yoga-sūtra. This book is available in a limited edition from Swami Rama Sadhaka Grama. 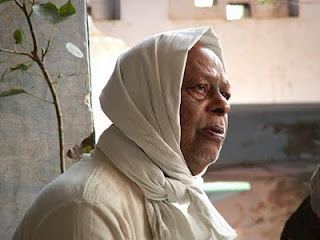 Swami Veda left this world in 2015 after which time I have spent most of my time in Vrindavan. I have also finished work on the Yoga-tarangini, which was published as a joint project by AHYMSIN Publishers and Motilal Banarsidass. Over the past few years, I have been collaborating with Satya Narayan Dasji of the Jiva Institute in Vrindavan as an editor of his translations of the Sandarbhas, starting with Bhagavat-sandarbha. We have now also started completed the Paramātma-sandarbha and Sri Krishna Sandarbha and work is currently going on with Bhakti-sandarbha..From 2016 I have been teaching Sanskrit to foreign students at Jiva. Currently, I am the chief editor of the Gaudiya Grantha Mandir, an important digital publishing project of Sanskrit texts, primarily in the Vaishnava tradition. This is a project meant to preserve rare works, and make them freely available to scholars and devotees on the Internet. Unfortunately, due to funding difficulties, the site is currently down. But with the help and support of Satya Narayan Dasji and the Jiva Institute, I am hopeful that we will be able to get this up and running again soon. In 2009 I started a project called Vrindavan Today, a news weblog dedicated to Vrindavan.. It has multiple purposes as stated in the given link. It is my intention to henceforth make my permanent place of residence in Vrindavan, where I have been living since 2011. Satya Narayan Dasji and the Jiva Institute, Jagannath Poddar of Friends of Vrindavan, Shrivatsa Goswami of the Sri Chaitanya Prema Sansthan and others are supporting this project. Other than this, I hope to complete a few scholarly works, a translation of Gopāla-tāpanī Upaniṣad and its commentaries, Dāna-keli-kaumudī (much of the research work can be found in this blog), a compilation of my historical investigations into controversial issues in Gaudiya Vaishnavism. With the players after the performance of Jive Daya Natakam in January 2019. Bhaktivinoda Thakur's meat eating has been a subject of some interest on this blog. The article I wrote in 2007 has been one of the most read on this site and still regularly attracts readers. As I have been revising the translation of Sva-likhita-jīvanī, I have been asked by certain people to censor any mention of meat-eating in the book. I have said emphatically, "absolutely not," because it is my feeling that this would completely destroy one of the principal themes of the book itself. This was written on the basis of Sundarananda Vidyavinode's Sri Kshetra and intended for a devotee audience, as it was done on a commission by disciples of Bhakti Promode Puri Maharaj. It has never been published. I decided to put this on line since there was a discussion on Facebook on the subject and I thought I would revisit what I wrote here nearly twenty years ago. This is from chapter ten on temple renovations. Life-size carved figures of men and women in various sexual postures (mithuna) as described in the Kāma-sūtra of Vatsyayana have long been visible on the outside of the temple building and inside the Jaya Vijaya gate. Even so, with the deplastering and restoration program of the Archaeological Survey of India, many more such carvings on the temple came to light after being hidden for centuries. Jiva Goswami spends several sections of the Bhakti Sandarbha (152-159) explaining that bhakti is free of the material qualities. In this discussion, he also mentions the Holy Dham and so I wish to discuss the nirguṇa nature of the Dham here. When I started Vrindavan Today, I was imbued with a nostalgia for the Braj-Vrindavan of yore, which looked lost under the influence of India’s economic development. At the same time, we have an apparently insurmountable dogma: The Holy Dham is not within the material qualities of nature. So we have to understand what that means. What does it mean that bhakti is not within the guṇas when everything in this world, according to the Gita and Sankhya philosophy, is just the interplay of these qualities? How can something, like Vrindavan, which is clearly being influenced by the Maya saṁskāras that surround it, the saṁskāras of saṁsāra, be considered transcendental to the guṇas?